Rumana Husain writes some lovely books for children and Kala Bhooth (کالا بھوت ) is just one such story she gave ToffeeTV permission to record and produce. Kala Bhooth refers to the plastic bags which we use and throw away. These plastic bags travel with the wind and water and can actually harm living things around us. Through Kala Bhooth, Ms Husain and the ToffeeTV team would like to ask each of you to promise to stop using plastic bags as much as possible! Order ToffeeTV merchandise online at TohfayMall! MashaAllh jee aap log bohot hi acha kam kar rahay hain. Pakistan se bahar Rehnay walay bachon k liye Urdu sikhnay k liye bohot hi achi site hai. Allah tala aap logon ki Tofiqat main Izafa Farmaye. aameen. 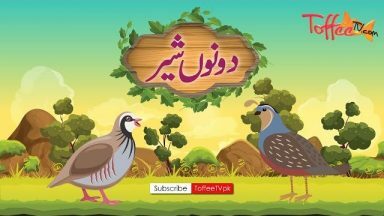 ALL THE BEST TO TOFFEE TV ,U R DOING GOOD JOB FOR URDU STORIES.